When your little one begins to speak, it’s an incredibly exciting time for both you and your child. On the other hand, many parents, especially first-time parents, begin to become curious about whether or not their child is reaching the right developmental milestones of speech at the right time. The truth is, every single child is a bit different and develops at their own pace, in their own way. However, there are certain language development milestones that you will want to keep an eye out for. You can uncover what they are below. What Happens at Age 1? It is normal when a child is around one-year old that they will begin to say a few words here and there. As a parent, it’s important that you pay attention to the words that your child is saying and whether or not the context is there. For example, when your child says “mama,” are they talking to their mother or trying to get her attention? In order to make sure you are aiding your child in any way possible, be sure to read to your little one every single day. Additionally, talk to your child whenever you can, giving directions and seeing if they understand what you are saying. What Happens at Age 2? This is the year when you will likely see the biggest strides made in regards to your child’s speaking abilities. Typically your child will be saying around 50 words and will have began to string them together into small phrases. While pronunciation isn’t going to be perfect, this is completely normal. What Happens at Age 3? By the time your child is three years old, he or she should be able to say full sentences with only about 25 percent of what they say being misunderstood. There won’t be much need for them to point to things anymore since they will likely be able to verbalize the majority of their thoughts. Your child will also be able to understand the commands you give them most of the time. By now, it’s most common for your child’s understanding of language to have taken off. They should be telling complete stories as well as identifying colors, shapes, numbers, letters, and more. They have also started to understand the general concept of time and understand more complicated demands given to them. All in all, you should also be able to determine if there is an issue with language by this point if you haven’t already. When you enroll your child at First Class Child Development, you can be sure that your child is being taken care of and learning all at the same time. We take pride in being a facility that puts our students and their needs first. 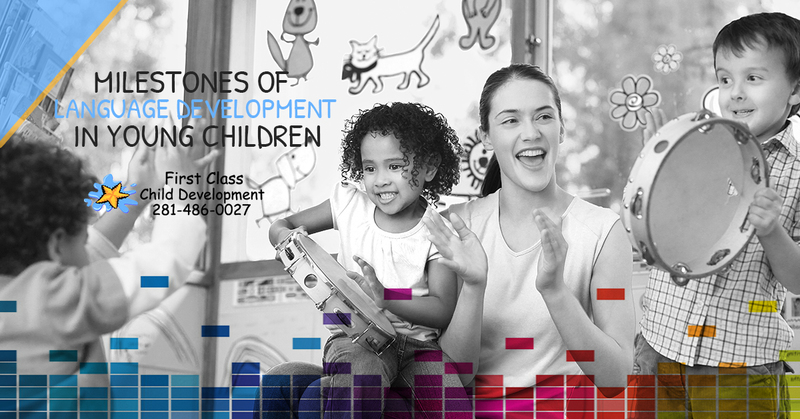 We know the ins and outs of child development and we use that knowledge to benefit those who attend First Class. Contact us today to learn more about our preschool. We would be happy to answer any questions you have right now!